The music blared from the cassette player. I'm sure the lyrics brought tears to Jesus’ eyes. Not the good kind, either. In fact these band members spoke openly against faith. I knew that. I also knew they promoted a careless, disrespectful lifestyle. But in my independent teenage mind, none of that mattered. Looking back now, I realize the damage I was causing. I sometimes reminisce about the past and cringe at some of the choices I made. I’m sure many of us have memories from the past that bring a heaping load of regret. 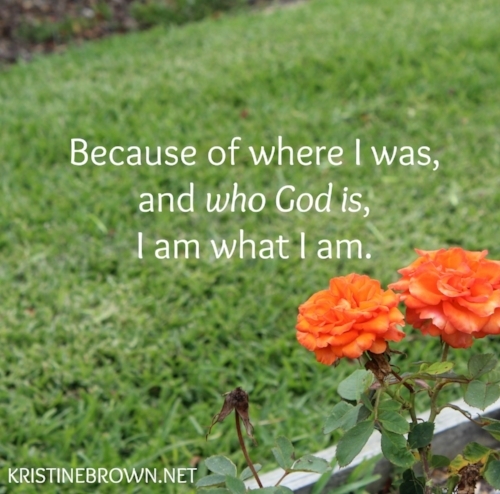 Sometimes when those shame-filled times pop into our minds, we quickly pray them away. We dig into God's Word to remind us who we are in Christ today. Because if we don’t, the enemy may try to grab onto those thoughts and consume us with feelings of defeat and discouragement. Being able to take those thoughts captive is an important part of growing closer to God. There are also times when the memories of past mistakes serve an important role in our lives. Paul points this out in 1 Corinthians 15. Those sins of the past reveal God’s power and define our purpose. Paul points out he is not even worthy to be associated with the apostles. Even so, he realizes it is God’s plan to use him, and God is able to do more than Paul can imagine. Have moments of your past been burdening you? Are you haunted by thoughts of a lifestyle you’d honestly rather forget? With the help of the Holy Spirit, we can take those thoughts captive. Then we can see them for what they are – a triumph for God’s goodness and grace. Dear Lord, I am thankful to be rescued and renewed, yet still growing and learning with you each day. Help us today to see our past the way You see it, as a testimony of a life transformed. Allow our focus to be on the journey we are taking with You, and may others be changed by seeing the change in us. Amen.